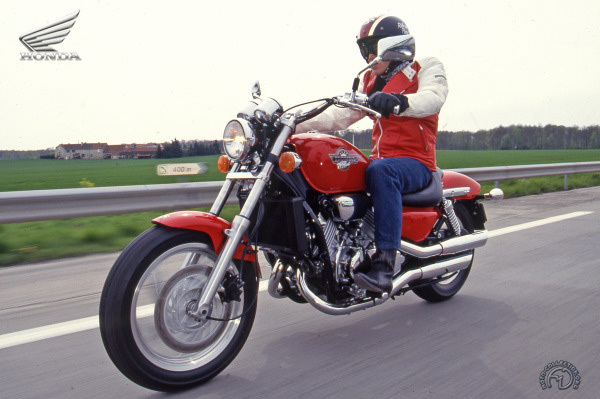 In 1982, Honda launched the VF750C Magna, an American-style custom bike with shaft transmission. The model was redesigned in 1988, with a disc rear wheel and extravagant, highly-aggressive mufflers, which gave it an absolutely unique appeal. But despite its many virtues and its technical perfection, the VF750C failed to rival the Yamaha V-Max – the undisputed class leader – in Europe. When it failed in its attempt, Honda waited for its time to come, while refining a version that had little more than its name in common with the original model. Its engine was inspired by the V-four of the VFR750F but had a different crankshaft orientation (360 degrees, against 180 degrees on the VFR). The center of gravity had been lowered and moved back, and, to suit the traditional custom style better, the cylinders (with an inclination 13 degrees closer to vertical) were given cooling fins, even though the engine was water-cooled. Another major difference was that the dohcs of the VFC were driven by chain rather than the costly gear drive of the VFR. The carburetors were the new VP type, with inclined bodies and a 2mm smaller choke size. In the healthy custom sector, sales in France reached 20,000 in 1992, equivalent to 17 percent of the market. All Honda could do, faced with such a great potential, was to react to it and make every effort to ensure that the 1993 version of its VF750C enjoyed the same success as its smaller sibling, the VF600 Shadow. After the highly-successful 600 Shadow, Honda revived a designation that it had discarded two years earlier and returned to the big custom field.